Do you Swim & Gym? The NattyMat is a soft and comfy changing mat which allows you to keep your feet away from the floor in communal facilities. The unique NattyMat design has a tough waterproof side which goes face down on the floor and a dry Bamboo and microfibre side which is perfect to stand on while dressing. Somewhere to keep your Havaianas? 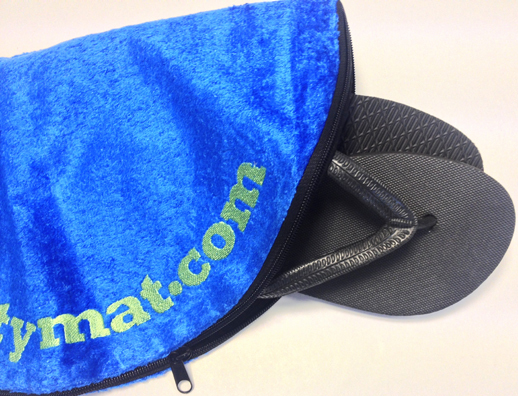 When you've finished changing, the patented NattyMat folds in half and zips up your flip flops or pool slippers as well as your wet swimming costume inside. That's great for all the family, especially the kids, keeping their feet away from any potential bacterial contamination. If you’ve ever found yourself standing on your towel or t-shirt you know what we mean. Even worse if you’ve had to stand your child on your towel too. That's why NattyMat is great at swimming pools, gyms and sports & leisure facilities. Because of its lightweight design - being only 100 grams - the NattyMat folds up really small and fits easily in a kit bag, rucksack or even a pocket. This makes it ideal for outdoor events when the weather might decide to have a quick rain or be damp on seats and benches while out walking or at concerts and festivals. NattyMat helps keep the wet from the dry at all times. No more 'soggy bottom blues'. Currently NattyMat is just available in two colour ways, a bright Aqua blue with a NattyMat logo featured in Orange, and an Ocean Blue featuring the NattyMat logo in bright Lime Green, both in keeping with the latest colour trends as seen on Nike running shoes, or Adidas Trainers and found at great stores like JD Sports and Sports Direct. You might have spotted that the Arsenal 2014/15 Cup Shirt is in the very same set of colours and would look great in the changing room with an Ocean Blue NattyMat. Cool natty colours to match your latest gear. Bamboo is a great natural fibre with many benefits. NattyMat is blended with 70% bamboo combined with 30% of other microfibres which makes it particularly absorbent and very fast drying. Don't you think That's Natty?